Since the tragedy of 9/11, when two planes crashed into the twin towers of the World Trade Centre in New York City, there have been many literary, visual and performing arts responses to the day. What did the people trapped inside do and think when they became aware of the unfathomable threat that could end their lives? One such response to 9/11 is the opera Between Worlds, which was performed at the Barbican two years ago. Tansy Davies composed the music; Nick Drake wrote the libretto. The opera takes place for the most part inside the north tower on September 11, covering the time before dawn until the end of the day, by which time both towers had collapsed. Music, song and design are interwoven to create imagined scenes with people expressing their gnawing, desperate need to make contact with their loved ones. They want to be sure that if they die, a loving, enduring spirit will follow in their wake, rather than angst. Looking up, people on the ground, the ‘chorus’, share the captives’ sense of helplessness. Horror is eating them up, too. Most people think opera is stuffy, elitist, for pompous connoisseurs, obsessed with ego-centric characters and their silly dalliances, adorned in expensive costumery, singing in front of sumptuous sets. Why do people spend so much on flummery? Between Worlds shows how relevant opera can be to our inner and exterior lives; each of us can relate, personally, to the sorrow, grief, fear, love and life experiences of the people in the towers. The tales of the doomed and the grievers could be our stories. Indeed, there are many historical and contemporary operas that will resonate with all of us; and if, as a scathing critic, you visit the exhibition, Opera: Passion, Power and Politics at the Victoria & Albert Museum (until 28 February 2017), curated in collaboration with the Royal Opera House (ROH), you could find yourself thereafter a frequent member of the audience, listening to opera on Spotify while you are at the computer, or singing arias to yourself as the bath water turns cold. Opera could very well become part of your life. The exhibition encompasses a collage of visual and performing art (more than 300 operatic objects are on view); it is not just a series of galleries with pretty pictures and explanatory, jargon filled panels. We see – and hear – how music, singing, lighting, set design, graphics, fashion, painting, drawing, printing, sculpture, jewellery making and carpentry work together to bring opera into being. Operatic excerpts and commentary on the audio guide (more a soundtrack than just a guide) enrapture us as we travel through the galleries learning about 400 years of operatic history. Each gallery focuses on a city and an opera that premiered in the city. When the exhibition was in the making, the then director of the ROH, Kasper Holten, determined that the “exhibition will show us opera as the soundtrack to the history of Europe. We hope to show audiences, both those in love with opera already and those who are still missing out, that the art form is alive and kicking and has as much to say to the society around today as it did 400 years ago”. First we visit Venice in 1642 and explore the premiere of Monteverdi’s The Coronation of Poppea. This tells the story, set in the first century AD, of the Emperor Nero’s infatuation with the beautiful Poppea who tries to make him divorce his wife and make her the Empress of Rome. The challenges of love, lust, greed, immorality, morality and betrayal vie with each other in an intriguing tale, which could be transposed to the pages of the tabloid press of 2017. We then venture in 1711 to London where we learn about Handel’s Rinaldo, the first Italian opera created for the English stage. It was set during the Crusades. This gallery displays somewhat hostile reviews in The Spectator magazine at the time of the opera’s premiere, yet the public loved the opera, in spite of the journal’s derisiveness, for its pageantry. In Vienna, we encounter Mozart’s comic opera, The Marriage of Figaro, premiered in 1786. The opera pokes fun at the arrogance of the aristocracy at the time and their presumption that they had the right to take advantage of the ‘lower orders’; the droit du seigneur is quite an issue here. Are there parallels with parliamentary behaviour today? In 1842, Milan welcomes Verdi’s Nabucco, a biblical story about the plight of the Jews as they are exiled from their homeland by the Babylonian King Nebuchadnezzar II. The narrative stirs reflection upon the plight of endangered exiles and conflicts in the Middle East in our times. Visiting Paris, we greet Wagner’s Tannhauser in 1861, a tale of lust culminating in damnation. Audiences did not appreciate the opera to say the least; maybe it made them feel uncomfortable. Wagner withdrew the work and despised Paris ever after. The once-scandalous Richard Strauss’ Salome, a setting of an Oscar Wilde play, premiered in Dresden in 1905. In St Petersburg, Shostakovich’s Lady Macbeth of Mtsensk made its debut. It tells the story of a lonely woman in 19th-century Russia who falls in love with one of her husband’s workers and is driven to murder. Stalin suppressed the opera two years after it premiered in 1934. In a newspaper, Stalin attacked Shostakovich for “trifling with difficult matters”…The opera, he wrote, was an “ugly flood of confusing sound”. Its themes of oppressive social surroundings and conventional mores and depiction of the Gulag challenged the righteousness of Stalin the omnipotent. As we move from city to city we see pass opera related exhibits such as the amended and re-amended notes on Handel’s original score for Rinaldo, costume armour for the opera’s Crusaders, and a working, mechanised, colourful replica of a Baroque theatre, where mermaids in Rinaldo sing as we watch a ship pitching through a stormy sea before the clouds part and it reaches safety. Mozart’s own piano is displayed. The material from the opera Lady Macbeth of Mtsenck includes Shostakovich’s autograph score, costume and set designs, posters and programmes. Archive footage reveals Shostakovich playing the music for Act III feverishly on the piano. We see Salvador Dali’s costume designs for Salome and opera related paintings by Manet and Degas. In a closing section we watch excerpts from 20th century operas, such as Gershwin’s Porgy and Bess and Einstein on the Beach, composed by Philip Glass, screened on the walls. Would the exhibition be too ‘grown up’ for young children, those perhaps under 11? The music and artistic artefacts would undoubtedly appeal to anyone of any age. Would the large screen extract from George Benjamin’s Written on Skin, revealing domestic brutality, disturb? Given what children are exposed to by social media and television, and the prettified violence of fairy tales and children’s novels, it is debatable how affecting it would be. Think deeply! On a more benign note, young people studying music would be fascinated by the exhibition, mesmerized, appreciating how the power and vigour of both the libretto and the music relate to each other. There are operas written especially for children, which are enjoyed by so-called adults, too. Recently, the company OperaUpClose commissioned and staged an enchanting opera, Ulla’s Odyssey. 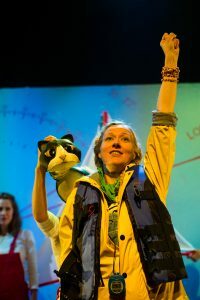 Homer’s Odyssey inspired Ulla’s, which grapples judiciously with contemporary issues such as climate change and female leadership. The audience, toddlers included, hailed the work with a standing ovation. Indeed, OperaUpClose Close is dedicated to increasing awareness and appreciation on of opera among the population at large. It presents contemporary and historic operas, in English, which are transposed to modern settings. The artistic director, Robin Norton-Hale, notes that 82% of the audience attending Ulla’s Odyssey at Kings Place were seeing their first opera, and “a staggering 92% of that group told us that they will now definitely see another opera in the future”. Britten’s Noye’s Fludde, for three adults and ninety children, The Firemaker’s Daughter, composed by David Bruce, which is based on the same named children’s novel by Philip Pullman, Jonathan Dove’s The Adventures of Pinocchio, Hansel and Gretel by Humperdinck and Janáček’s Cunning Little Vixen are several of the most highly acclaimed and endearing operas for children. Enlivening and enriching, the exhibition is living proof that opera is for each and every one of us, not just for ‘them’. Take deep breaths before you start singing about its wonders so that your voice will be all the more potent. This article was first published in the The American Hour Blog, November 2017.